Nose: Sweet and creamy malted barley, some fresh citrus, and a trace of regular Bruichladdich floral notes. The nose of this whisky is very similar to the 2006 Dunlossit Farm, but softer and more subdued. The slightest hint of creamed honey is also present in the nose. Palate: Similar to most Laddies, creamy malt is the predominant flavour on the palate of this whisky. Some green apple and lemon peel are also present – as are traces of vanilla pods, cinnamon, and creamed honey. Also the smallest trace of ginger right at the back trying to hide but not quite managing to do so. Mouthfeel: Rich and creamy, quite complex for such a young (5 years) whisky – thick but not dry. A little bit of oils – just a pinch. Also a slight alcohol tingle on the tip of the tongue. Finish: The finish is not all that long, but it is there. Once again the malt is predominant, with some dried apple chips, vanilla pods, and cinnamon fleetingly showing up. Some oak spices and a touch of heat from the young alcohol are also present – not enough to burn, but noticeable. The creamed honey that was present in both the nose and the palate has completely departed. On The Rocks: Really dampens the nose, but also brings the floral notes to the fore, and adds a slight bit more lemon peel. Boosts the floral, green apple, and citrus notes on the palate in a big way – the honey and malt are still there, but a bit more subdued; still a slight trace of cinnamon, but the vanilla and ginger disappear completely. It still has quite a rich mouthfeel, but is now more chewy rather than creamy. The alcohol tingle disappears completely as you’d expect it to. A quite different whisky when taken over ice – possibly even slightly better than without. I would not mind being served a dram of this either neat or on the rocks. Even with quite a bit of melt this whisky holds up quite well. This is the third release in Bruichladdich’s Islay Barley series – and hopefully far from the last. This barley for this whisky, from the Rockside farm on the western rhinns of Islay (a farm that was recently purchased by Kilchoman, whose distillery actually sits upon part of the Rockside land, and similarly to Bruichladdich have a series of bottlings that is grown and distilled on Islay – “100% Islay”), was harvested in 2006 and distilled in 2007 before being bottled in late 2013. Despite its young age of just six years, this is quite a mature and complex whisky, and is noticeable softer and subdued compared to the 2006 Dunlossit release. This is a superb whisky, rich and complex with many layers of flavour – a flavour that is so very Bruichladdich, and unsurprisingly very similar to the 2006 bottling, although not quite as ‘lively’ and lacking some of the fruits that are present in the previous years release. This release also has a touch of oils that the earlier one doesn’t have. A little bit of ice really brings the fruit – citrus (mainly lemon and orange) and green apples – to the front, although rather than diminishing the malt and the honey in any way, it really does just add to the flavour profile; giving this 2007 release a bit more of the punch that the 2006 release has. Despite being a brilliant whisky, I must say that it doesn’t rate quite as highly as the 2006 Dunlossit Farm release in my opinion, although only a smidge below – but to be quite honest there have been very few whiskies that I’ve sampled that are. I’m also sure that there are many people that would rate the two the other way around – they are both whiskies of spectacular quality. 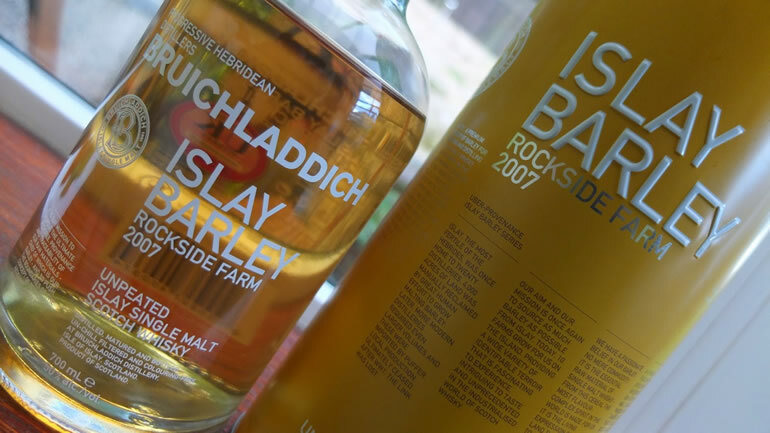 Bruichladdich’s Islay barley is one of their core lines based on their “terroir matters” philosophy – a philosophy that many in the Scotch industry have dismissed (at least publicly) for quite some time, but a philosophy that several smaller distilleries have started to adhere to over the past few years – not just in Scotland, but all around the world including Ireland; where Mark Reynier (former Bruichladdich CEO since its rebirth in 2001 until it was bought by Remy in 2012) has launched his new distillery at Waterford, and seems to be kicking the concept of terroir in whiskey up to eleven.